I started my day today with Tony and I going to the orthopedic surgeon for my left hip. He took new x-rays…and there is definitely a problem…more so with my left hip. The round ball that fits into the joint is no longer round…it’s flattened on the inside part…and is near bone on bone. The doctor said that he would not do arthriscopic surgery like I had on my knee….which is what I was hoping for…since I definitely have arthritis in both hips….but the left is MUCH worse than the right. He suggested a hip replacement…which at this point…with the pain I have with it every time I get out of a sitting position…I have come to the conclusion that I would rather have the hip replacement than endure the constant pain. So I am going to check with my work about going on disability/FMLA, etc….and see the dentist(the doctor suggested getting any dental work done before any hip surgery….to reduce the chance of infection). I just made my dental appointment for this Thursday. Tony and I will be going on vacation starting on the 26th for a few days at the beach…then I’m taking the rest of the week off and get some things done around the house. If the weather is nice…I want to start refinishing the crib I have for Chrissie during those last few days of vacation. Then I will make another appointment to see the doctor and schedule the surgery. He said the surgery can be scheduled for 2-4 wks after I notify him….and so I think I’m shooting for sometime around the end of March. This will give me plenty of time to recover and get the physical therapy I will need before my two grandbabies arrive this summer. Man it’s hell growing old! 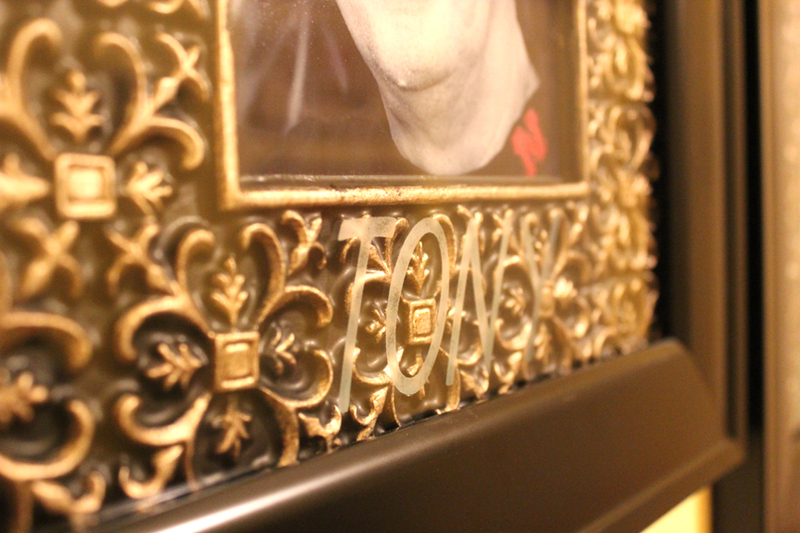 For Valentine’s Day, I made Tony two framed pictures, one of each of us….and I etched our names into the front bottom part of the glass. 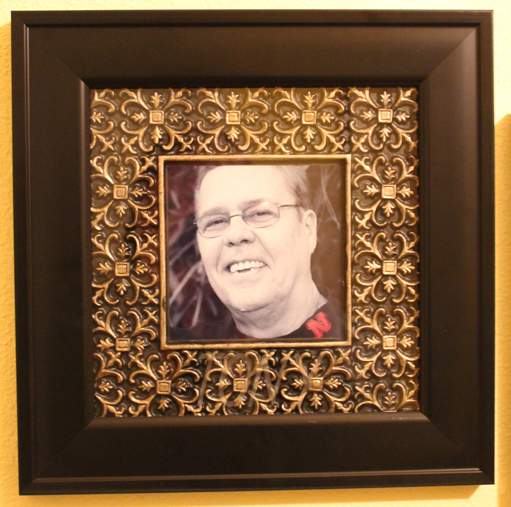 The mat that surrounds the picture is very bumpy with a patterned texture, so it’s kind of hard to see the glass etching unless you look at it from the side where the light shines off of them. But that’s ok….I like how they turned out anyway. 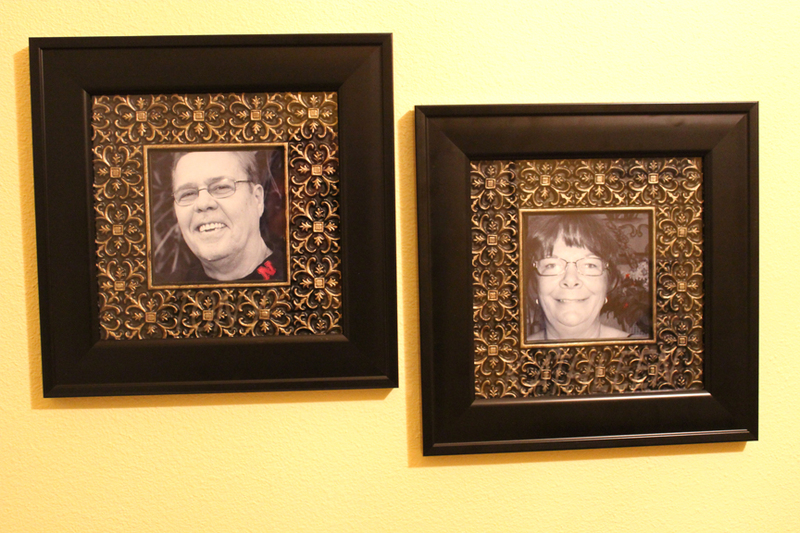 I want to start a wall of pictures of our families…and these two are a nice start to that. 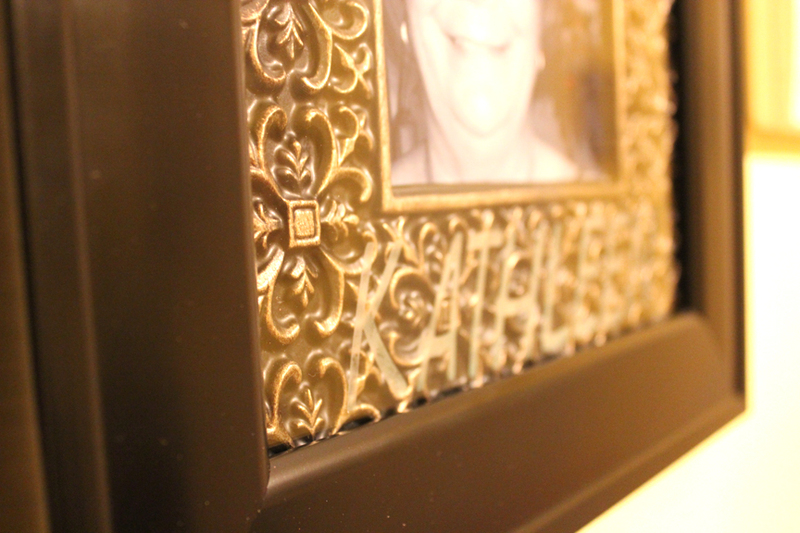 My walls are yellow…and I have black curtain rods in the living room….so I am using picture frames in black….for starters….and if I find some in black wrought iron to mix in….I think that would look nice too. 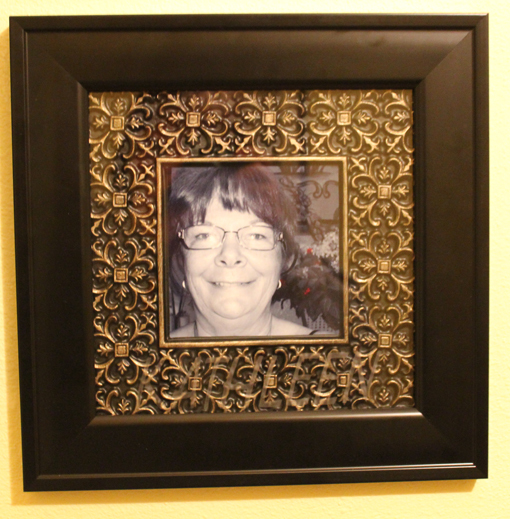 I am not really happy with the picture of me in the photo above….hopefully I can take a nice photo on our vacation at the beach and replace it later. This entry was posted on Monday, February 14th, 2011 at 3:20 pm and is filed under Uncategorized. You can follow any responses to this entry through the RSS 2.0 feed. You can leave a response, or trackback from your own site. I’m so sorry that you have to have the surgery, at least you are having it done before the babies come. Did he say that you might have to have the right one done at some point? It is hell getting old! Love the picture frames they look great on the yellow walls. Hi there….he did say that my right hip also has arthritis…and it’s about 2-5 years behind my left hip. So I assume….I might have to have it replaced too….ugh!